One of the notable by-products of advancements in technology in the past decade is that working remotely has become easier than ever. There’s a direct correlation between more jobs becoming computer-reliant, technological advances, and the growing trend of working remotely. There have been sizeable increases in broadband speeds and improvements to WiFi and video conferencing technology. Advancements in mobile and cloud collaboration technology are also driving the digital shift in workplace structures. And, of course, the number of tech-savvy millennials entering the workforce is another factor. Forbes reported that in 2016, “43% of Americans spent some time working remotely”. The World Economic Forum’s employment trends forecast cited telecommuting as one of the main factors affecting changes in the workplace. As attractive as working from home may seem, it’s admittedly not for everybody. There are challenges, such as maintaining a productive balance between home and work. Less social contact and not being able to network in person with co-workers may also prove to be a difficult adjustment for some. For most of us, however, the idea of working remotely from a home office is very appealing. Whether you’re working remotely or self-employed and working from home, there are definite benefits to having your workspace where you live. Some of the benefits (like saving time) may be obvious, but there’s a few other ones you may not have considered. Here are seven key benefits of working remotely from a home office. Being able to set your own hours is the most obvious benefit of working from home. As mentioned, it can be tricky finding that healthy balance between your home life and your work responsibilities. Once you do find a good balance, however, the flexibility and freedom that comes with working remotely can be liberating and empowering. Along with setting your own hours, you can also manage your non-working life much easier. You’ll love being able to take care of tasks like grocery shopping when the stores are less busy. Appointments can be scheduled at times that are more convenient to you. Or maybe you’re a night owl who does their best work after the sun goes down. If so, you’re tailor-made for telecommuting. Some adjustments to your work schedule may need to be made to accommodate phone or video conference calls or occasional visits to the office. But for the most part, you can dictate when your work gets done. While setting your own work hours is a nice luxury, those with longer commutes to the office might just consider saying “so long” to that part of their daily routine the most welcome aspect of working remotely. The national average for commute times is 26 minutes (that’s each way, to and from work). In Toronto, that average jumps to 34 minutes, the highest in Canada. If you happen to live a significant distance from where you work and need to travel during peak traffic times, you could be spending a dozen hours or more per week commuting. We all need to make a living, but at some point you have to ask yourself exactly how much your time is worth. Working remotely virtually eliminates this stressful, unpleasant part of the working experience. All of that time you’ll reclaim from not sitting in your vehicle for several hours every week can be spent on more worthwhile things. If you’re able to work from a home office, you’ll also have a little more flexibility with where you can live. You won’t be as tied down to being located within a short commute to your office…because your office is just a few steps away from where you woke up. The time you’ll save from working remotely doesn’t just add up by eliminating your commute. Since your home office is now your workspace, you can spend less time on getting prepared for work. That doesn’t necessarily mean you’ll want to start each work day still dressed in your pajamas, mind you. Getting showered and at least putting on some decent day clothes helps to get you in a working mindset. This helps to maintain that healthy balance between your professional worker self and your casual at-home self. But if you wake up and feel like getting right to work, working the occasional time in what you wore to sleep is at least an option you never had before! Being able to telecommute allows your day to get off to a start that’s a little less rushed, which sets a better tone for the rest of your day. Working from home and the time saved by doing so can be devoted to just about anything. You can spend more time with the family, pick up a hobby, start exercising regularly, or invest it right back into your work schedule. Think about how many interruptions and distractions you get at work. There’s the constant operational noise of the office, co-workers dropping by your desk to chat or ask a question, water cooler conversations, and meetings to attend. A busy office environment can restrict productivity, which is a problem you won’t have when working remotely. A survey by Staples found that 86% of telecommuters feel they’re more productive working from a home office. A 2013 Bank of Montreal (BMO) poll of Canadian businesses found that 65% of them saw increases in productivity from their remote workers. Other studies and surveys show that telecommuters are largely more engaged with their work and miss fewer days than those working in a shared office space. Developing a productive work regimen and blocking out the distractions that are unique to a home working environment may take a little work at first. Once you do have them figured out, you’ll wish you had been able to work from home years ago. Designing your home office space for maximum productivity is one key part of developing and maintaining a productive home working routine. One of the great benefits of telecommuting is you can shape your own workspace design any way you want. Most shared office spaces are sterile and have lousy artificial lighting. That type of working environment can make it harder to focus and get the most out of your work day. A bespoke home office space that’s tailored to your work needs and offers more flexibility should result in better productivity and a higher comfort level. Start by choosing a good spot for your home office, preferably a room with plenty of natural light. You’ll also want to pick a room that’s separated enough from the rest of your home to avoid interruptions and encourage a consistent workflow. Your custom home office should be designed to make your most frequently done work tasks as easy and convenient as possible. 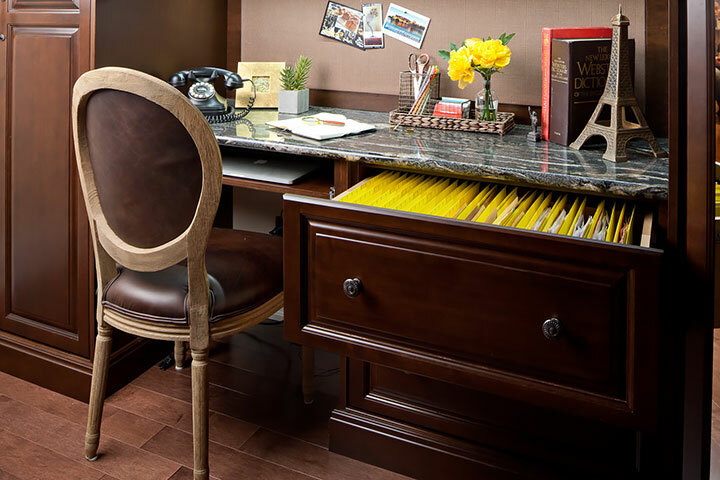 Keeping office clutter to a minimum will boost productivity, so ensure your home office design makes it as effortless as possible to stay organized. View our bespoke home office gallery to discover what kind of productivity-boosting home office ideas Organized Interiors offers. Have your home office designed for maximum productivity and comfort. With all the conveniences that come with working remotely, it won’t come as a surprise that telecommuters feel less stressed than those working in a shared workspace. Study after study shows that those who work at home have lower stress levels than workers in office environments. For starters, you won’t need to deal with any aggravating office politics and drama. That Staples survey found that on average, employees who transitioned from working in an office to working from home reported their stress levels were 25% lower. 73% also felt that they were eating healthier since they started working remotely. A 2017 Flexjobs survey of 5,500 workers shows that 78% of the respondents felt that a job with work flexibility (like telecommuting) would result in them being healthier. 86% said they believed they would be less stressed. The survey also found that stress from commuting was the fourth most popular answer (45% of respondents) as to why someone would seek a job that allowed them to work from home. Another benefit of working remotely is it allows you to save money. You may be able to write off your home office space, office furniture, and office supplies as a tax deduction. How much you can claim will depend on your employment status. Those that are self-employed will have more flexibility with tax deductions than those who are considered full-time employees with a business. The money saved on gas costs alone from commuting will add up to a substantial amount. You’ll also put far less wear and tear on your vehicle, which will extend its life. CNN reports that the average American spends $2,600 yearly on commuting costs. You could take those savings and put them toward a relaxing family vacation. Whether you’re working remotely, want a office space for doing taxes or work on the computer, or need a home study space for your kids, Organized Interiors specializes in designing fabulous bespoke home offices. To plan how your home office space can be designed to get the most out of how you need to use it, book a free in-home design consultation with us. The new school year is now well underway, which means your kids will once again be making homework a regular part of their daily routine. It can be a challenge for parents to get their kids to complete their homework on a consistent basis. The widespread usage of high-tech devices nowadays has also become just one more issue for parents to contend with when it comes to keeping kids focussed on their homework tasks. Creating a home study space that promotes a productive and comfortable learning environment can help keep your kids motivated and focussed on their homework. A learning environment that’s aesthetically dull, clutter-filled, uncomfortable, and too noisy won’t allow kids to get the most out of their study time. Psychologists have found that one’s environment can have a significant effect on the quality of their study time. Specifically, information retention and work productivity increases when kids study in a space that’s comfortable, familiar, and has as few distractions as possible. A dedicated home study space can be customized to create just such an area for your kids. Organized Interiors specializes in creating beautiful home office spaces. The same elements we implement in the design of an adult home office space can also be applied to the design of a home study space for kids. When planning the design of your home study space, here are seven essential features and ideas to consider. The location of your home study space is extremely important. Even the most well-designed and highly functional study area will have many of its benefits diminished if the location isn’t right. Like a home office, a home study space is a perfect fit for a spare room. You’ll have more room to add all the design features you want and also create more privacy. Converting a spare room into a home study space also affords you the opportunity to create a separate, dedicated space purely devoted to learning. Naturally, not everybody has the luxury of having a spare room at their disposal to set up a home study space. We can work within the dimensions of your home to create a study area within a bedroom, in a basement, or just about anywhere you have a reasonable amount of space to spare. Wherever you decide to set up a home study space, give a lot of consideration to potential distractions like foot traffic and noise levels. A study area set up beside a noisy laundry room, for example, doesn’t make for the most learning-friendly environment. Remember, a quiet study space will be a more productive study space. How many kids will be using your home study space? Obviously, the more kids you have that will be using the study space the more room you’ll need to have it designed properly. Perhaps you’ll need a shared study space for your home if you have two or more kids. That’s not a problem. Multiple desks and workstations can be set up to fulfill your home study space design requirements. Each of your kids can have their own designated area in the study space, to create as comfortable a learning environment for them as possible. You may also wish to create a multi-purpose home office/study space within a room, which we can accommodate. This can be a smart choice if space is an issue in your home. A shared, work-oriented space between parents and the kids can satisfy everybody’s needs. The foundation of any work space is the desk. You’ll want your desk surface to be big enough that it can accommodate all of your kids’ textbooks, notebooks, school supplies, and a laptop if necessary. You also need to be careful that your desk isn’t too big. If you have a bigger desk surface than you really need, there’s more of a chance it’ll start accumulating clutter. We can guide you on the ideal desk size that will work best within your home study space. Organized Interiors designs, manufactures, and installs all of our furniture, so we have a lot of flexibility when it comes to customization. 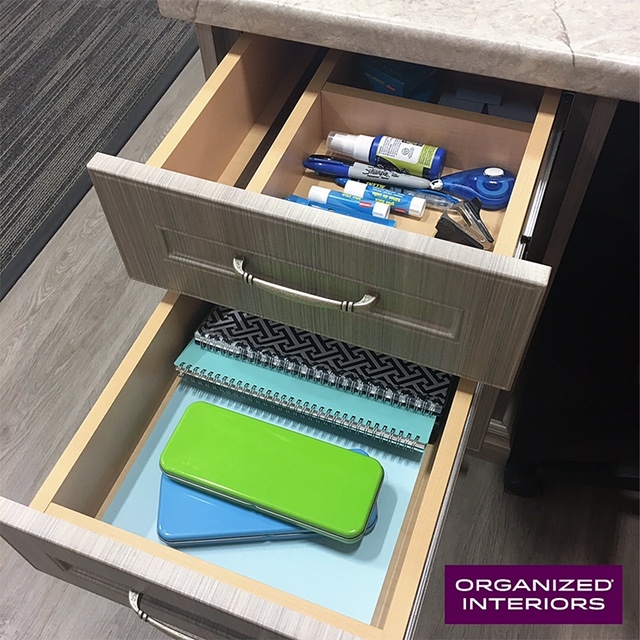 Add as many desk drawers as you desire (and to the width and depth you need) to hold your kids’ school supplies, stationery, and printer paper. Does your child use a desktop computer as opposed to a laptop? Add an under-desk keyboard drawer to save space! A well-designed desk will require less effort for you to keep your home study space organized and clutter-free. You’ll be able to keep more frequently used supplies close at hand while storing less frequently used supplies out of sight, but easily accessible. An absence of clutter in any work space will facilitate a more productive workflow by allowing you to concentrate much easier. You can increase the functionality of a home study space or office by adding extra storage systems. A custom bookcase provides plenty of room for storing your kids’ books. 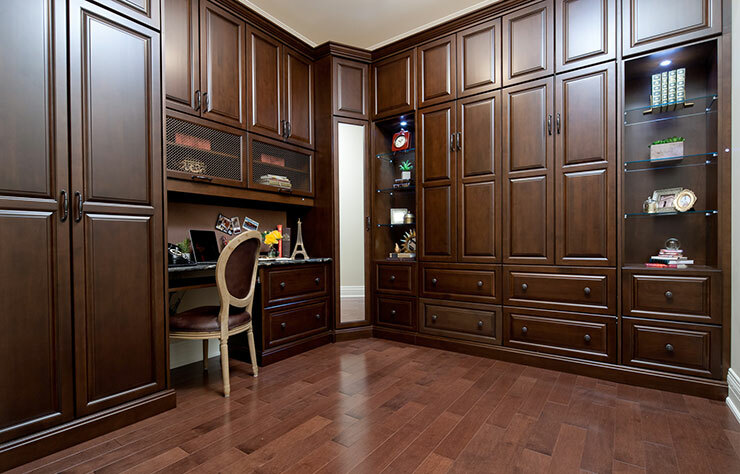 Upper storage cabinetry can also be added to provide extra storage room in your study space. Using your room’s vertical storage space (which can also include adding library shelves) will enable you to stay organized more easily. Vertical storage is also smart to use when your study space is set up in a smaller room. Your home study space’s custom cabinetry can also include lower drawers, cupboard doors, file cubbies, and file drawers. Add extra touches like a tack board for posting reminders, calendars, and course schedules. A study space doesn’t have to be dull, style-free environment. You can choose from a wide variety of finishes and features to add some character to the room. Upper storage cabinetry can include frosted glass or mesh doors. LED lighting with convenient touch switches and puck lighting can also be incorporated into your home study space design. View this photo gallery for some more inspiring home study space and home office ideas. As mentioned, a learning environment that’s comfortable is important and comfort in a home study space starts with a good desk chair. You’ll want to invest in an ergonomic chair that makes it easy to maintain a healthy posture. Your kids will appreciate having a chair that provides excellent lower back support, especially for those longer studying sessions. Having a proper desk chair set up at the proper height can also alleviate problems that can affect other parts of the body, like the neck, wrists, and hands. Just as a good chair can minimize back discomfort, so too can good lighting minimize the problem of eye strain in your home study space. You don’t want to keep your home study space too dark, otherwise it might make the occupants more prone to nodding off. If possible, make use of as much natural light as you can. Choose ambient lighting that’s complemented with smartly located task lighting and a small desk lamp. Wall and ceiling colours in the room can also affect the moods and concentration levels of kids. Lighter greens, yellows, and blues are considered good colour choices to stimulate productivity. The wall and ceiling colours you choose for your home study space can complement the chosen finishes for your custom cabinetry, thereby enhancing the room’s look. While your home study area is meant to be a dedicated learning space, it can’t hurt to inject a few personal touches to it. Add plants, hang some inspirational quotes, or add photos of family and friends to create a warmer, more inviting space. Just be sure to keep the personal touches to a modest amount so your kids aren’t overly distracted. A home study space can be a great asset that enables your kids to flourish with their studies. Schedule a free in-home design consultation with us to get your home study space project in motion. Millions of Canadians work from home, whether they’re self-employed or telecommuters (those who have an arrangement with their employer to work from home). There are definitely advantages to this type of work setup. For example, there’s the time saved by eliminating commuting, not having to deal with workplace politics, and the freedom to work while wearing your pajamas, to name just a few. Another advantage is being able to determine the look and layout of the work area where you earn your living. Which home office ideas are worth considering? There are many home office ideas worth considering when designing your office space. 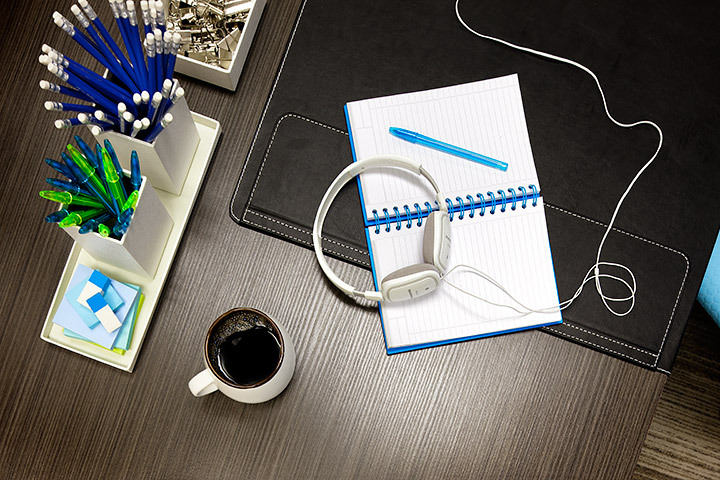 Choosing the right ones will make your workspace stylish and also enable you to be productive. Let’s look at the seven key questions you should be asking when creating a home office, along with the best home office ideas to choose. Having a vision in mind for what you want your home office space to be will be a great help to the Organized Interiors design consultant who’ll be helping to bring your home office vision to life. 1. What will my home office space be used for? There are many reasons for creating a home office space and knowing exactly what your home office will be used for is an important first question to ask yourself. Identifying the main purpose for your office and how it will be utilized will establish the foundation for its design. 2. Where should I put my home office? A spare room is obviously the most ideal spot to set up a home office. 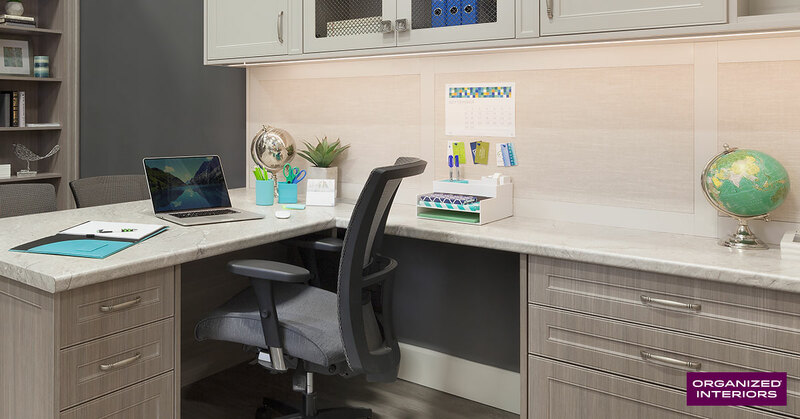 It allows for more space, which gives your home office designer much more flexibility to include all of the home office design elements you desire. Extra room will also be more important if your business requires having visits from clients. If you’ll be spending lots of hours working in your home office, extra space is also ideal. Spending 40+ hours per week working in a confined space with little or no sunlight likely won’t help you maintain a strong level of work productivity. A spare room should also provide your workspace with natural light, which is beneficial. One other crucial consideration related to home office location is privacy. Choosing a location that removes you as much as possible from potential distractions will help facilitate a stronger, more consistent workflow. If you’re having clients over then having a quiet, private home office location is also more important. 3. What if I don’t have much space to add a home office? Of course, space considerations may limit your options for where you can add a home office. That doesn’t have to be an obstacle when it comes to using many of these home office ideas, however. 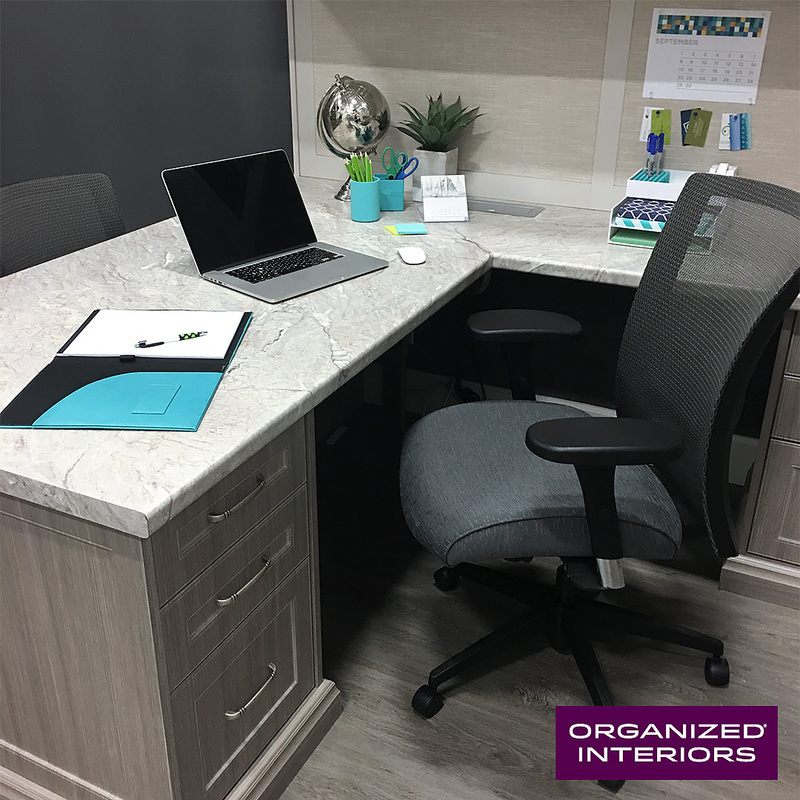 Organized Interiors can create a home office space in just about any area of your home, like the bedroom, family room, or basement. We can also create a multi-purpose space that combines a home office with a guest room that saves space with a custom wall bed. Keep this in mind for tax purposes: to write off the room your home office is located in as a business expense, more than 50% of its use should be for work. 4. What type of work equipment will I be using? 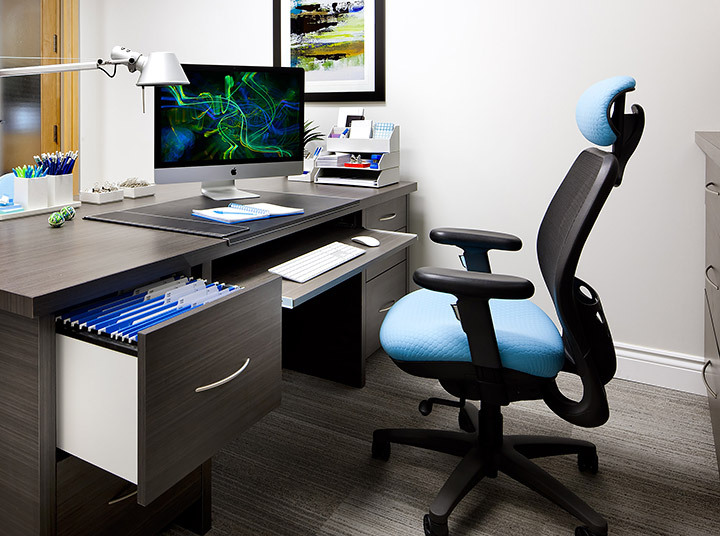 Be clear with your home office designer on what type of work equipment the home office will need to accommodate. Your main work tool will almost certainly be a desktop computer, which creates the opportunity for a number of design options. Do you want your computer keyboard always sitting on the desk or would you prefer it out-of-the-way and on a pullout tray? Maybe you’d prefer to have an increasingly popular standing computer workstation designed for you. Your office will also need to have space for supplies and other types of electronic equipment, such as phones, printers, charging stations, scanners, modems, photocopiers, desktop speakers, and external hard drive backup storage. You’ll want your office design to make efficient use of space for these, have enough outlets, and to keep their wires and cords hidden. The more frequently used items also need to be set up in a convenient, easy-to-access spot for you. 5. What will I be storing in my home office? All businesses increasingly rely on digital invoices, receipts, and word processor files. You may still generate a sizable amount of actual paperwork in your day-to-day work, however, or have lots of older physical files and records that you need to retain. Our experts can design efficient home office storage systems that will fit the needs of your business and space. 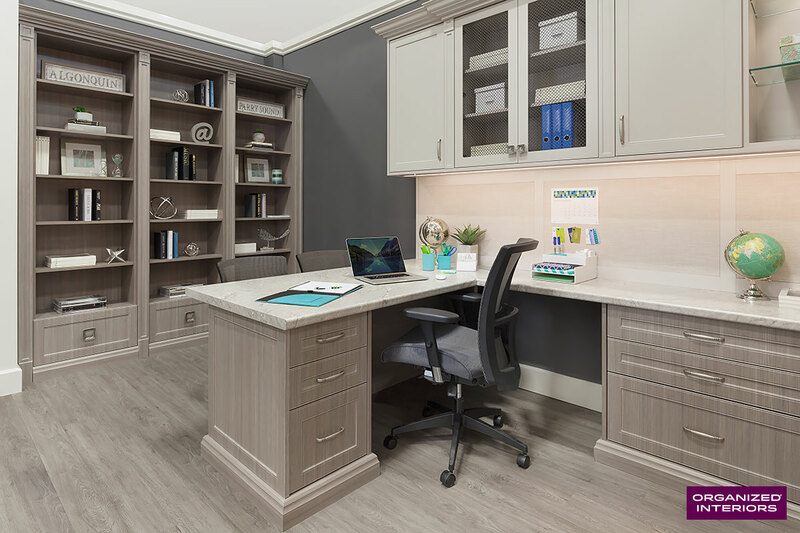 Our custom free-standing and built-in cabinetry (including book cases and file storage drawers) and office desks are designed to accommodate anything that needs to be stored in your home office. Because we design and manufacture our own products, we can also customize your storage system to maximize storage space. 6. What type of decor do I want my home office to have? Ask an Organized Interiors design consultant about the wealth of colour, finish, and decorative hardware options we have available for our custom home office solutions. Additionally, if you’re having a home office space designed to be part of another room (like a bedroom or guest room), we can design it to complement the existing decor of that room. 7. How can I make my home office a comfortable, yet productive space? Your office is meant for business, but what home office ideas will make it comfortable, as well as a space that lets you be productive? We’ll ensure your office desk and surroundings are designed so you’ll have all the space you need, without clutter accumulating. Considering how much time you’ll be spending in it, you should also invest in a comfortable, ergonomically correct chair. Add some small personal touches to the room, such as family photos, artwork, knickknacks, and some plants. Be mindful of keeping potentially distracting items (like a TV) out of your home office. A home office should be more than a cold, dull workspace – it can also be a stylish and attractive part of your home. We can use these home office ideas to create such a space. Schedule your free in-home consultation today with one of our design experts. Space can be at a premium in small homes and condos. Perhaps you find yourself craving a proper home office space, but have overnight guests on a regular enough basis to make you reluctant to change the design of your guest bedroom. Maybe you have an existing home office space and only have guests stay over a few times a year, but their sleeping accommodations could be improved. One of the best spare room ideas is to turn your extra room into a multipurpose home office and guest room. A practical wall bed will be one of the key components of your new multipurpose room. Wall beds are also referred to as “Murphy beds” and their biggest benefit is how much space they’ll save you. During the day, the wall bed folds up, creating plenty of floor space. When it’s needed, the wall bed easily unfolds for use. If your idea of a wall bed involves antiquated images of thin, ugly mattresses and creaky mechanisms, you’ll be surprised at how far they’ve advanced. The modern quality wall bed is stylish and just as comfortable as any other bed. They’re also a much nicer sleeping option for your guests than makeshift arrangements that has them sleeping on a pullout sofa, futon, cot, or an air mattress on the floor. Custom wall beds can be built as an individual unit or as part of a larger custom cabinetry unit. You can enjoy the benefits of open shelving, drawers, and built-in lighting in the beautifully crafted cabinetry unit whether the wall bed is down or up. Depending on your needs, you can choose from a single, double, or queen-sized wall bed. The hardware on our wall beds also comes with a lifetime warranty. A wall bed creates an instant guest room in a condo. If you have guests that stay for lengthier visits than just one night, a closet organizer will help them feel more at home, especially if they’ve brought more than one suitcase. A closet organizer will make it easier for guests to manage their wardrobe during their stay. And if you’re not entertaining guests for awhile, you can take advantage of the closet organizer’s helpful storage features for temporarily storing some of your extra wardrobe. Your dual-purpose office/guest room needs to be kept organized. This makes using it on a daily basis easier and it will require minimal cleanup when houseguests require the space. 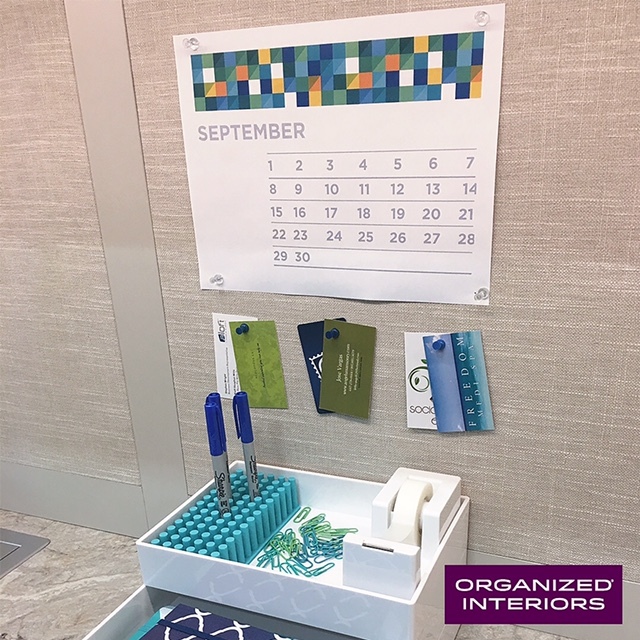 Use elegantly designed customized cabinetry for the office to keep all of your office supplies and belongings organized and out of sight. Along with these main design elements of your multipurpose room, add a few tasteful and cozy touches to the space. A rug, fresh plants, and artwork are well-suited to both guest rooms and home offices and add a nice touch of warmth. Use these spare room ideas to create a multipurpose room and maximize your home’s space. Your guests will definitely appreciate the comfortable surroundings you’ve thoughtfully provided for them! One of our design consultants will be happy to meet with you in your home to discuss your spare room ideas, so book your free consultation today. Organizing home office clutter is a challenge for most of us. But an organized workspace simply makes life easier, whether it’s at your job or in your home. 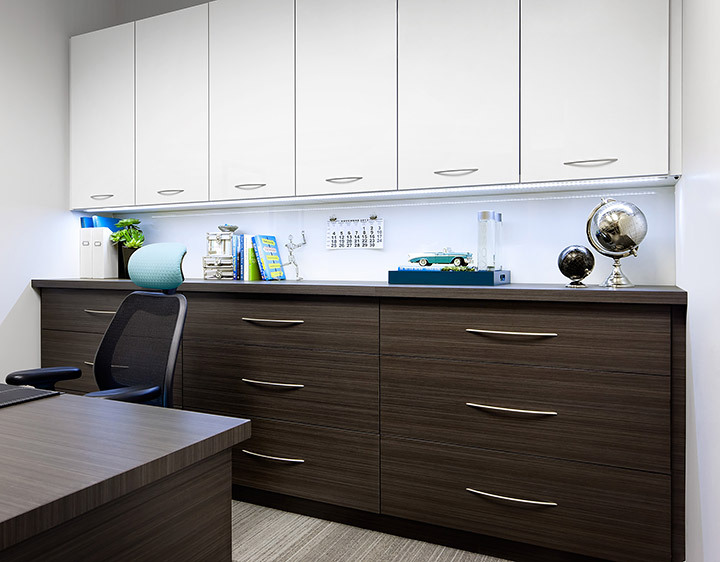 Most importantly, a tidy home office will improve your productivity. The Wall Street Journal estimates that office workers waste an average of 40% of their workday because of poor organizational habits. A clean desk and office also reflects positively on your work ethic and organizational skills. Get rid of that clutter both at work and in your home office and you’ll notice your work productivity increase in no time. Cramming papers and office supplies into your desk drawers might keep your desk clean, but it can make bills or documents hard to find. Consider using one or more of your office drawers for labelled file folder storage. Finding that important document will be much easier. When all that piled up office paperwork becomes too much, scan your documents and organize them digitally instead. You can always print out a hard copy if needed and that decrease in clutter will boost your productivity. It’s convenient to simply pile documents and folders on top of each other in order to minimize desk clutter. This isn’t an effective way to manage clutter or stay productive – you’ll just spend more time organizing in the future. Rather than putting them into piles, put office papers away properly after you’re done using them. Email management is also an important part of office organization. A cluttered email account can decrease productivity and make it difficult to find important messages. Create email subfolders and spend a little time each day putting your emails into the correct one. Better yet, automate the process using email rules to keep your inbox organized. Some office supplies are used every day, but others are only required every few months. Keep frequently used materials close by, such as in your desk drawers. This ensures you won’t waste time each day sorting through clutter to gather the supplies you need. Don’t let home office clutter decrease your productivity. Organize the mess and then take the time to maintain your tidy space. Solutions can be as easy as making better use of your existing office setup or updating your space with an improved office storage system. Contact a design professional at Organized Interiors today to eliminate your home office clutter.